Watch The Shadows. They live and as they breathe and expand; it is the sign of the Sacred Seal breaking down. As it ruptures, shadow energies and chaos forces will flow free in the forms of creatures and demons. Power hungry Immortals will try to conquer Earth’s Realm. The Ascension, the Gods’ primordial scientists created the Sacred Seal, and engineered a fail-safe in the event of its corrosion. A Key is needed to activate the fail-safe; The Ascension Equation. The time has come for it to be assigned to a mystic warrior..
A young activist learns that his Ancestors were chosen mystic warriors. Now, he’s gifted The Ascension Equation and has the power to defend Earth against chaos. The tipping point begins with Chicago and he’s not going to let that happen. So he trains to unlock his True Potential and become the Urban Mage. Your Page Is stunning and well done. very bold. Great job. Mystic! Thank you very much. I appreciate it! I am excited to grow this site, publish more content and projects. Salute! Congratulations on your webpage Ced. 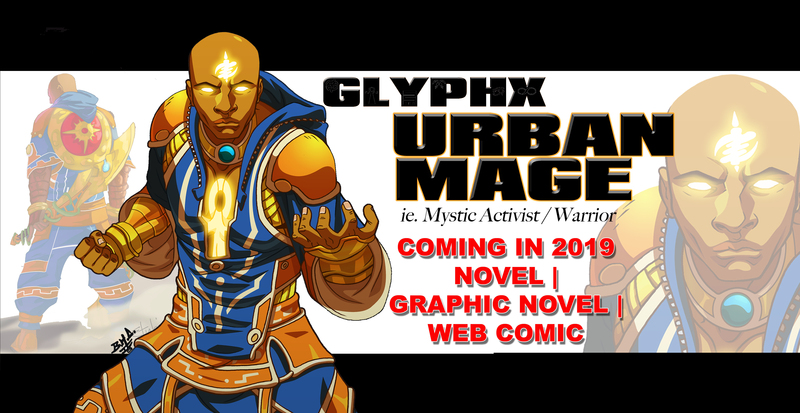 I’m humbled and honored to have GlyphX to be a part of the StarFall story. Thank you very much. Thank you for the opportunity; continued Success with StarFall! THIS IDEA IS DEFINITELY A WORD EYE WANT 2 READ THE ENTIRE BOOK…BOOKS. You are definitely working it! NICE SITE! Thank you for checking out the site. I appreciate it. There is more to come in 2019! Love what the story is about. It seems to have endless possibilities. I love the art so far also. U know I will be watching u.
I appreciate your kind words! I want to create a great visual storytelling experience that can expand across mediums. Wow. Thank you and much respect. I am sincerely trying to do just what you expressed; small steps towards the bigger goal. Excellent Character design and Concept! ONYXCON looks forward to seeing you present this at a fiture event in ATLANTA, GA! We wish you continued success! Peace. Thank you very much! I appreciate the support of kind words. I will try to make it down for the event. Very nice site and great concept, looking forward to seeing how everything develops down the line! Peace! Thank you very much! I appreciate it. I’ve taken note of your web-comic, Stealth: The World’s Greatest Superhero ; where you began until now. I look forward to putting the work in. Peace, Alberto. Thank you! Stay tuned there is more to come! Site looks good. Real easy to navigate. Premise of the the story is intriguing. Looking forward to reading it! Peace, Glenn! Thank you. I really wanted it to be easy to navigate so visitors and readers can read and enjoy what they find. I look forward to your project as well. Salute! Looks Great! Looking forward to seeing the graphic novel! Peace! Thank you! I am working hard towards that very goal. Excellent! I love the ascension equation concept, as opposed to the witch in the dark web, an intriguing pairing of mysticism and futurism, curious to read the ensuing adventure! Peace, Thank you, Derrick. I am working hard to bring some unique twists and ideas to make GlyphX’s life difficult. I can’t wait for your project as well. Peace. Thank for the great words of support. I appreciate it. This is beyond extraordinary my brother! The site is easy to navigate and well designed. The character piques my interest greatly. I’m in awe with your ability to extract from our African mythology to create a concept that rivals any European counterpart with originality and finesse. I’m excited to be on hand to witness what occurs next! Peace and thank you! I am excited to read your words. I am working hard to deliver a character and stories that will make an impression, of some kind, on everyone who reads the book. Your work, as well as many others, are inspirations to creating a unique character. Hopefully, mine can sit upon the pantheon of literary heroes, as well. I see tou will be bring the heat in the New Year! Can’t wait to see it! Peace. Thank you. I am planning more to deliver; adding to the web-comic and preparing for some printing too. Looking forward to the new comic! Peace. Thank you. I’m happy you like it so far. I’m working hard to build on yours, and everyone’s positive feedback. I’m excited! Peace! Thank you I’m glad you like it. I am excited to see it grow as well.